My three very best friends from college came to visit this past weekend, and it was wonderful! It was a short visit, but a good one. We just hung around, played with the kids, ate (of course), and enjoyed catching up. I love that I am still so close to all of my bridesmaids. We still talk on the phone, but it's just not the same as getting together! I hope we're able to continue the tradition of getting together at least once a year for a very long time. I love these girls! 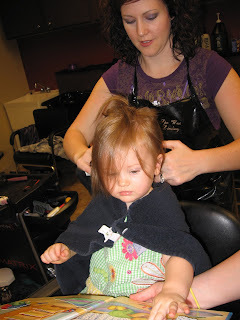 Houses and haircuts and birthdays--oh, my! Our house is officially for sale! We put it on the market this past week, and I am planning to get an apartment here in Searcy when we sell it. Why Searcy? I have a strong church family here and friends to have playdates with for Abby. Plus, I'm SO close to finishing my masters degree at Harding. It will be much easier if I don't have to try to complete it long distance. Why an apartment? Abby and I won't need all this room when Casey is gone, and I don't want to keep up with house/yard maintenance. Pray that we sell it soon! I don't actually have any pictures of my hair yet (too busy taking pics of Abby, I guess), but I'm sure we'll take one eventually. Aunt Tara made a really cool cardboard house for Abby! 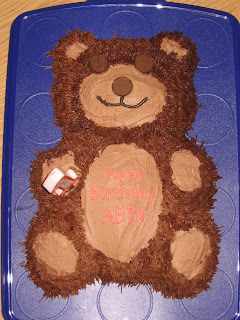 My teddy bear cake! The tummy says "Happy Birthday Abby" (written by Nana), and the eyes and nose are Hershey kisses. :) He's holding a "1" candle.